New Delhi, December 1, 2011: The Advanced Tibetan Women’s Leadership Training (ATWLT), the second in the series, an undertaking of Tibetan Women’s Association (TWA) reached its pinnacle yesterday with the concluding ceremony in the form of a symposium held at the India International Center, Lodhi Road. 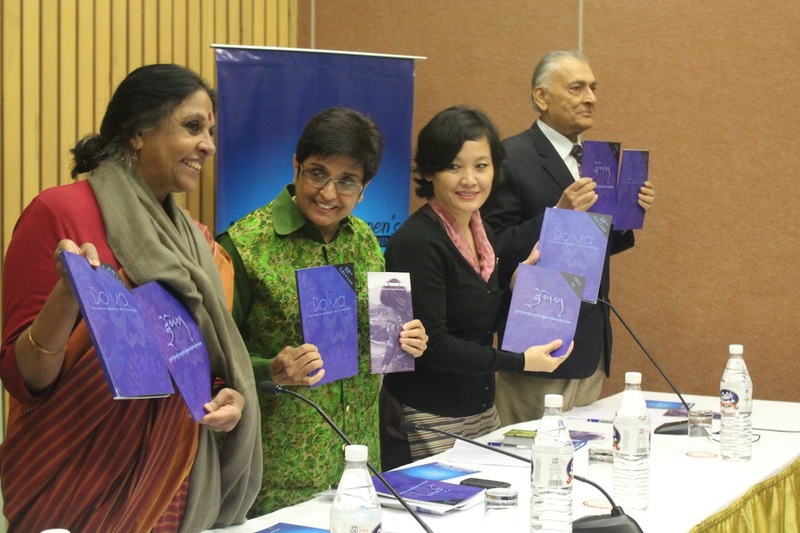 Four prominent and distinguished personalities were panelists: Dr. Kiran Bedi, Social Activist and (Retd) Indian Police Officer, Youdon Aukatsang, Senior Member of the Tibetan Parliament in Exile, Jaya Jaitly, Political Activist and former president of Samta Party, and Vinod Saighal, (Retd) Major General. Each panelist provided an earnest insight into the topic ‘Women’s Leadership in the 21st century, a Noble Achievement’ and each received questions from the audience of dignitaries, participants of the 2nd ATWLT and members of the media. The symposium was moderated by Dhardon Sharling, member of the Tibetan Parliament in Exile and Research and Communications officer of TWA and lasted for 90 minutes. Dr. Bedi expressed her deep admiration for the Tibetan people and said, “I respect the way you are carving your life and fighting for your own value system.” She stressed that while men boast of the ‘3 Ms – muscle, money and mobility’, women are bestowed with ‘3 Hs – head, heart and hand’. In response to a question on the dwindling Indian political support for the Tibetan cause, Dr. Bedi reiterated the crucial role of the Tibetans in India who are making outstanding contributions to their host country to show great appreciation and to gauge support of the Indian government and people. “You should all be Dalai Lamas in India and make India proud” said Dr. Bedi. Youdon Aukatsang reflected on the status quo of women’s leadership in the Tibetan community in exile and lamented the traditional barriers that still play a deterring factor in enabling a balanced representation of men and women in the political arena. Youdon stressed the future imperatives of Tibetan leadership, which must be the presence of more women leaders. “It’s time for women to lead from the back and the front and thereby fit into all realms of the political arena”, said the young member of the Tibetan Parliament in exile. Political activist Jaya Jaitly stressed that leadership is achieved only when one tackles a challenge and that women should brave and face challenges with a strong fervor, grit and commitment. Jaya advised that Tibetan women should embark on reaching out to the oppressed women of South Asia. “As women belonging to a group whose rights have been violated you should reach out to the suffering women; particularly the women in Nepal caught in human trafficking, women in Pakistan caught in the blasphemy laws, and women in Afghanistan who fear a conspiracy between the Taliban and the United States,” said Jaya. The ten-day ‘Advanced Leadership Training’ (November 21 – 30) was held at the Tibetan Youth Hostel, Rohini. 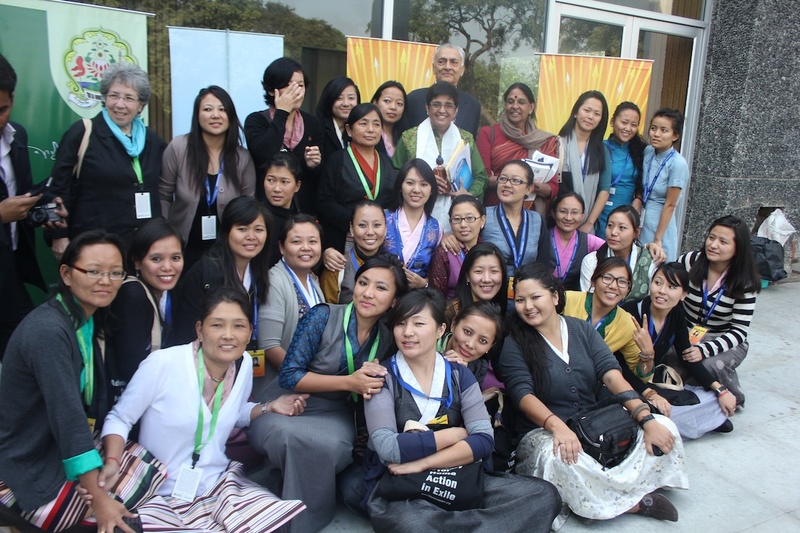 28 Tibetan women attended from many parts of India and beyond – (Pokhra-Nepal, Tenzinghang –Arunachal Pradesh, Kalimpong, Chennai, Bangalore, Mandi, Dharamsala and Delhi) and from various backgrounds. There were graduate students, professional workers, settlement officers, journalists and political activists. The training course was divided into three phases – identifying, building and practicing leadership skills. The final phase of the training provided ample practical experiences – exposure trip, event management, lobbying Indian leaders and the panel discussion with women leaders (Indians and Tibetans). The highlights included: active participation in the NDTV studio debates such as ‘NDTV special ‘Is Tibet a lost cause,’ chaired by Barkha Dutt’ and ‘NDTV Left, Right and Center’ hosted by Nidhi Razdan. On November 28, a planned hour-long observing session at the Lok Sabha house of Indian Parliament to witness the ongoing winter session was cancelled after the unexpected adjournment of the House at 12 Noon. Nevertheless, the participants staged daylong ambush lobbying of the Indian leaders at the Parliament grounds which resulted in four Members of the Indian Parliament signing the ‘Stand up for Tibet’ pledge. The participants stated enthusiastically that this leadership training provided a breakthrough for them and for Tibetan women to scale new heights of leadership, be active agents of change and make headway in breaking barriers for women. They have ascended from being ‘I’ to ‘we’ and to ‘us’ and significantly from raising women’s role in leadership from being ‘seen’ to also being ‘heard’. The crux of the ten-day training dwelled on the emerging reality that the 21st century indeed is a century of women’s proven leadership. “The TWA led training was a monumental success in transforming young women into potential leaders,” said Yeshi Choedon, an NGO worker based in Pokhra, Nepal. TWA’s primary goal is to advocate for the rights of Tibetan women inside Tibet and to empower Tibetan women in exile. TWA’s ‘Empowerment Through Action Desk’ provides a central point of contact for resources for Tibetan women in exile, while effectively coordinating empowerment programs in culturally appropriate and gender sensitive ways. TWA imparts leadership and empowerment actions, which include the Advanced Tibetan Women’s Leadership Training, the Annual Young Tibetan Women’s Leadership Program, the All India Gender Sensitization Training, Combating Domestic Violence and the Annual Tibetan Nuns Leadership Training.